Notice the convention center roughly in the same spot as the planned Albany Capital Center. 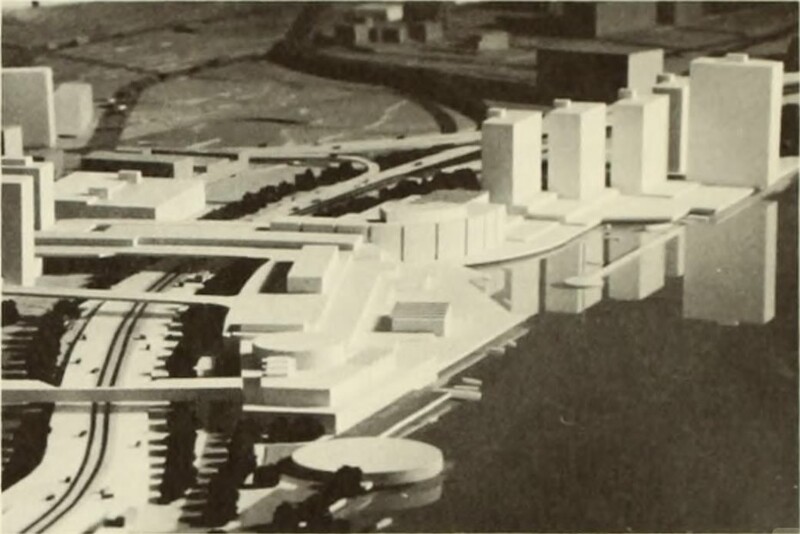 Models of the proposed development along what's now the Corning Preserve. 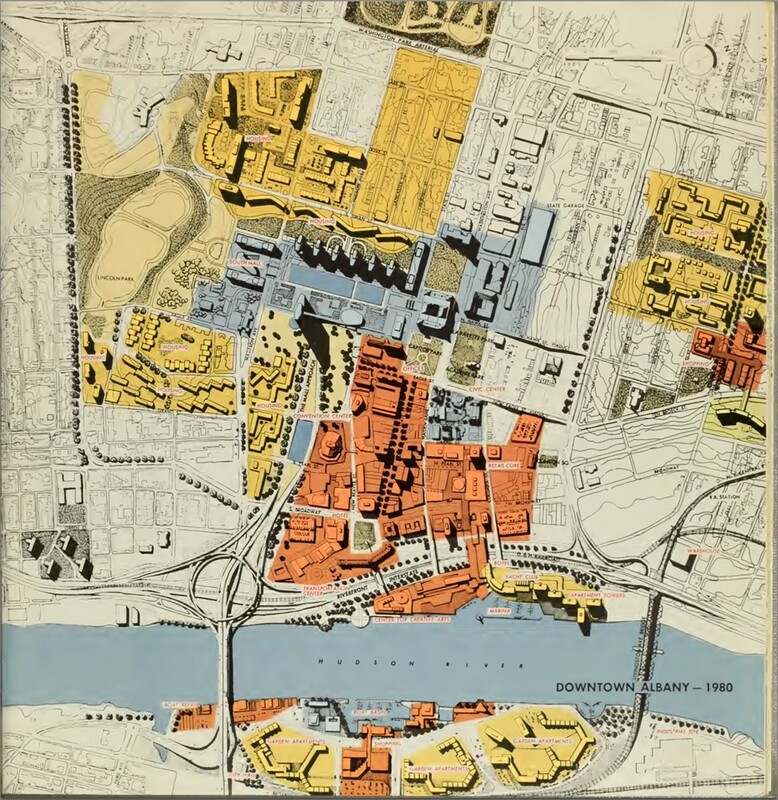 This map doesn't show much -- though those green spaces are kind of interesting -- but we clipped it because the plan includes some nice mid-century graphic design. 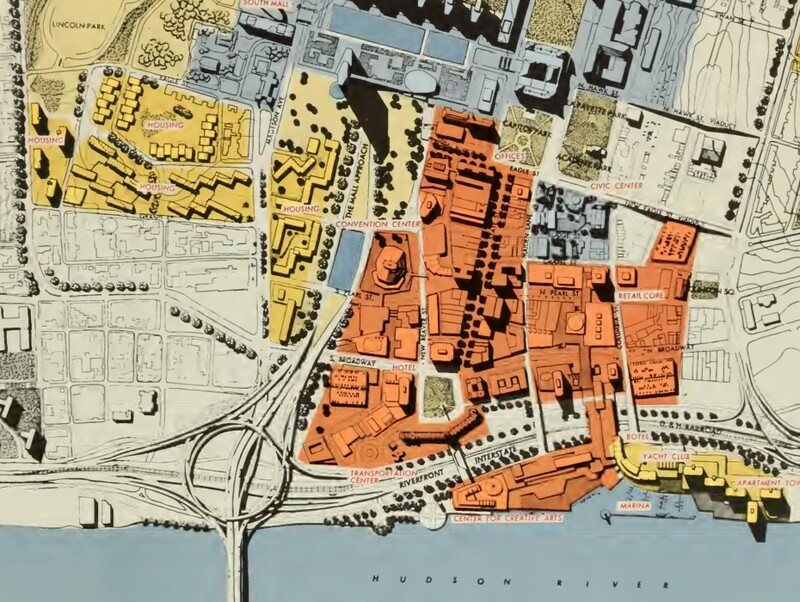 Check it out: A comprehensive plan for redeveloping the city of Albany -- as proposed in 1963. A convention center on Elk St, housing at Jennings Landing, "The Washington Park Arterial"... it's so scary! Heres the take away quote: "By 1980, central area of Albany, like cities all over the United States, will be almost completely rebuilt." The plan is fascinating, both because parts of it are remarkably prescient and others are totally bonkers. Here's that text passage we mentioned. "Key 1" struck us as remarkably prescient, and it highlights how the Harriman Office Campus influenced many decisions after it (something that doesn't necessarily always get attention now). The list also includes some completely bonkers ideas. The location of State Government offices is the "key" to the arrangement of other activities. The alternatives are described below. KEY 1 - EVOLUTION: If present policies and programs were continued, including completion of the State Office Campus, this would cause a permanent dichotomy of Albany's dominant component, State offices, accelerating the dispersal of Tri-City functions. The Latham center would become the area's major commercial core, in the absence of a strong focus on downtown Albany. KEY 2 - CORE CONCENTRATION: If the State Government would return to Albany's core, this would confirm downtown Albany as the center of activity and commerce in the Tri-City Area. "Campus" buildings would eventually be converted to State University use. KEY 3 - MOHAWK FOCUS: If a new Capital were built, as at Versailles, Brasilia, or Chandigarh, dramatically overlooking the Mohawk River, this location would become the center of the emerging Tri-City metropolis. It would confirm Latham as the commercial core. KEY 4 - THACHER PARK FOCUS: If a new Capital were built in Thacher Park, in an even more dramatic location overlooking the entire metropolis, and clearly visible from everywhere, this scheme would provide no impetus to other components in the Tri-City Area. It would isolate the Capital and encourage further suburbanization in the area. KEY 5 - TRANS-HUDSON COUNTERPOISE: If the State Government reestablished within Albany's core, it would spur the latter's other functions, as in Key 2, and would contribute to re- developing both sides of the river. A major research center would be developed on the heights across the river in Rensselaer, and the waterfront reclaimed for cultural and community use. The plan settled on option #5. I love how all four of the Albany apartments I have lived in - on Dove Street, Hudson Ave, Grand St, and Madison Ave - would have been flattened. The Capital in Thacher Park?? I'm dying. Too funny. ..."and the waterfront reclaimed for cultural and community use"... like an interstate highway. Planning studies are academic. Reality comes from what the funding provider / politician(s) tells the municipality to do. "By 1980, central area of Albany, like cities all over the United States, will be almost completely rebuilt." It's amazing how many cities across the country, of all size, embarked on the whole urban renewal craze of the 60s. In retrospect it seems foolhardy but at a time when people were spilling into new and gleaming suburbs and popular culture was rife with imagined visions of "the future" a lot of city leaders saw old brick buildings and narrow streets as a liability. They believed their only solution to keep people from leaving was to make their cities new and modern as well, even if it meant ripping down buildings and reconfiguring streets on a truly monumental scale. It would be interesting to see what American cities would be like had all the urban renewal projects come to fruition. Some progressed further than others but almost nowhere was the renewal as drastic as originally planned. I'm fortunate Albany still has most of its historic core, Empire State Plaza and I-787 notwithstanding. If Albany and other cities had turned their downtowns into glorified office parks with wide streets and lots of parking, they might have been spared the painful exodus to the suburbs in the 70s and 80s but I wonder if today they would find themselves in the same predicament they did in the 60s. Nowadays historic architecture is treasured, people want more density, more walkability. Albany still has enough of these things to give it a bright future but had they succeeded in implementing their 1963 plan it would be a great irony that after going through all that trouble to remake the city, 50 years later they would be again stuck with a downtown that was "out of style." It's funny how the proposed development along the waterfront looks like the proposed DeLaet's landing, only mirrored on the other side of the river (plus one casino, possibly). Key 4 is so crazytown, I love it. Can you imagine the traffic and parking issues if the capital were up there?! 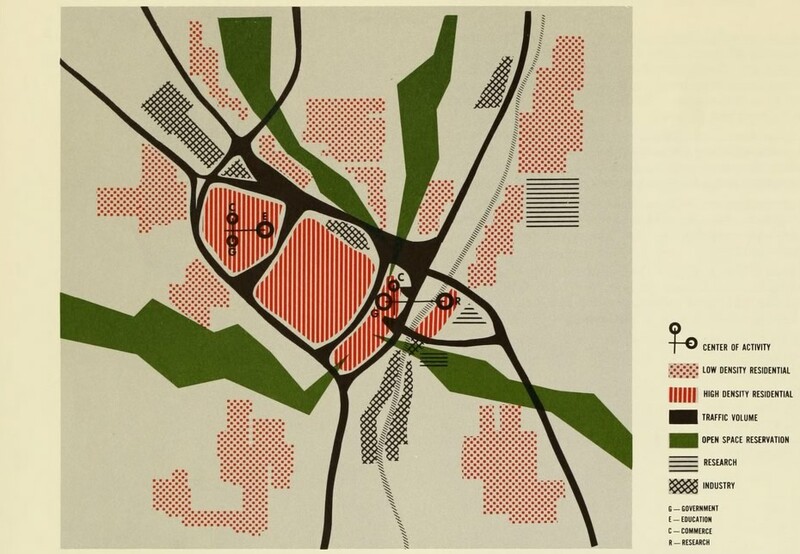 The focus on Latham is interesting - little did they know just how sprawling and commercial ALL the suburbs would become. This is also awesome and grandiose: "If a new Capital were built, as at Versailles, Brasilia, or Chandigarh..."
Always comparing Albany to Versailles, so tiresome! 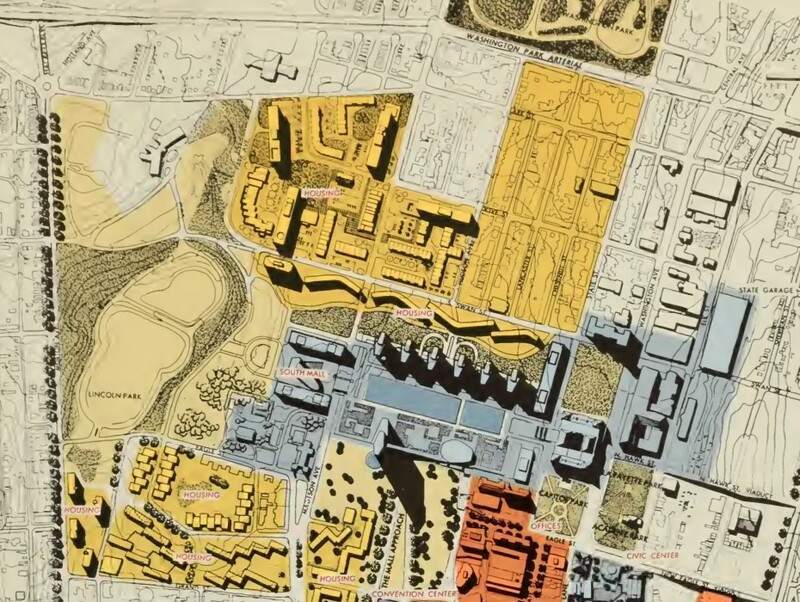 Did any of the buildings in the plan that supposedly resembled Brasilia actually get built?